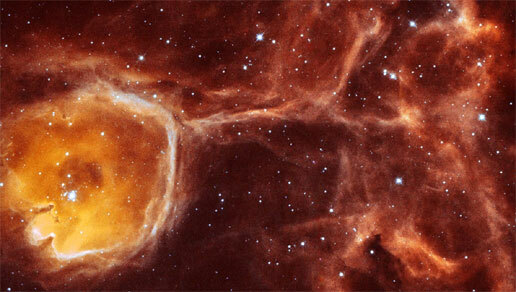 Hubble Space Telescope image of a bubble-like cavity, called N44F, 35 light-years in diameter, which is being inflated by a stellar wind from a very hot star once buried inside a cold dense cloud. The central star in N44F is ejecting mass at a rate greater than a 100 million times that in the solar wind. The particles in this stellar wind move at 7 million kilometers per hour, compared with about 1.5 million km per hour in the case of the Sun. N44F is located about 160,000 light-years away in the Large Magellanic Cloud. Credit: NASA, ESA, Y. Nazé (University of Liège, Belgium) and Y.-H. Chu (University of Illinois, Urbana). A stellar wind is the continuous flow of gas from the surface of a star into space. It is most intense toward the beginning and the end of a star's life, as exemplified by T Tauri stars, on the one hand, and red giants and supergiants, on the other. Among the most extreme stellar winds, resulting in a loss of 10-6 solar mass or more per year, are those that occur in X-ray binaries, in which in O and B stars are being stripped by a compact companion (either a neutron star or a black hole). During their time on the main sequence, most stars blow a very modest stellar wind; in the Sun's case this amounts to a mass loss of only about 10-14 solar mass per year (see solar wind). Stellar winds represents an important mechanism by material is returned to the interstellar medium to be recycled as a new generation of stars.